As for some people who like adventurous experiences, they prefer to keep moving as much as possible with their favourite transport. This transport shall allow them to go anywhere with no boundaries and no restraints. And FOSJOAS U3 can do them a good favour. With tougher features, U3 is labelled as a personal exclusive SUV electric scooter. There are some similarities between V9 and U3, but U3 also has its own improvements and refinements. Therefore, it is safe to say that self-balancing electric scooter U3 is the successor of V9. The same as V9, U3 still applies the two-wheel structure and the standing-posture riding mode. U3 is both strong and fashionable like V9 because of its sleek and contoured features. The pure imitation is obviously insufficient. U3 has made some improvements. U3 adopts 16-inch large tyres. Equipped with such jumbo tyres, U3 2-wheeled electric scooter can be ridden on any terrain. Negotiating the rugged terrain or go downing the steps is no longer a challenge to U3. One time, a rider rode it in the open air. The path was not even. But it was no problem for FOSJOAS U3. It still passed the path. FOSJOAS U3 is equipped with a fender bracket made of aerospace aluminium alloy, which is resistant to bumps and strikes, light-weighted yet with wonderful load capacity, enabling riders to take away some instruments. In terms of battery, 680 W battery is adopted by U3, which offers larger lasting power capacity. Thus, electricity blackout halfway will not happen to U3 electric self-balancing scooter. In the meanwhile, travelling for a longer time and distance will be a piece of cake for U3. 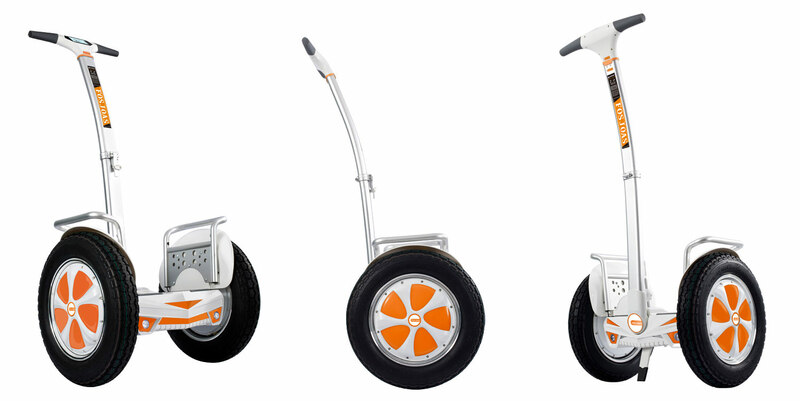 U3 intelligent cheap electric unicycle, in addition, can be more compact by employing a foldable design for its shaft. Users can store U3 in car boot and takes it out for a ride outside the city.